Traditionally, psychoanalytically oriented clinicians have eschewed a direct focus on symptoms, viewing it as superficial turning away from underlying psychopathology. But this assumption is an artifact of a dated classical approach; it should be reexamined in the light of contemporary relational thinking. 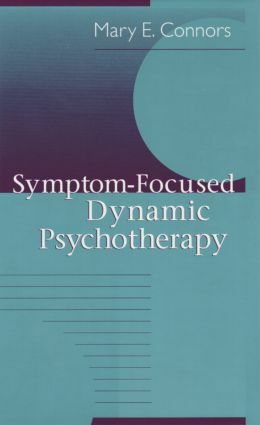 So argues Mary Connors in Symptom-Focused Dynamic Psychotherapy, an integrative project that describes cognitive-behavioral techniques that have been demonstrated to be empirically effective and may be productively assimilated into dynamic psychotherapy. What is the warrant for symptom-focused interventions in psychodynamic treatment? Connors argues that the deleterious impact of symptoms on the patient's physical and emotional well being often impedes psychodynamic engagement. Symptoms associated with addictive disorders, eating disorders, OCD, and posttraumatic stress receive special attention. With patients suffering from these and other symptoms, Connors finds, specific cognitive-behavior techniques may relieve symptomatic distress and facilitate a psychodynamic treatment process, with its attentiveness to the therapeutic relationship and the analysis of transference-countertransference. Connors' model of integrative psychotherapy, which makes cognitive-behavioral techniques responsive to a comprehensive understanding of symptom etiology, offers a balanced perspective that attends to the relational embeddedness of symptoms without skirting the therapeutic obligation to alleviate symptomatic distress. In fact, Connors shows, active techniques of symptom management are frequently facilitative of treatment goals formulated in terms of relational psychoanalysis, self psychology, intersubjectivity theory, and attachment research. A discerning effort to enrich psychodynamic treatment without subverting its conceptual ground, Symptom-Focused Dynamic Psychotherapy is a bracing antidote to the timeworn mindset that makes a virtue of symptomatic suffering. "This volume might well be a valuable addition to the syllabus of a graduate course in which psychoanalytic or psychodynamic therapy is a central topic. The book is clearly written and well organized and is an accessible read…"
Preface. Rationale for a Symptom-Focused Dynamic Treatment. Active Techniques in a Context of Integrative Possibility. The Decision to Use Active Techniques. Cognitive Interventions. Behavioral Techniques. Suggestions for Intervention with Specific Symptoms. A Patient with Compulsive Behaviors. A Patient with Generalize Anxiety. A Patient with Binge Eating and Depression. A Patient with a Relational Dilemma. A faculty memory of the Illinois School of Professional Psychology, Mary E. Connors, Ph.D., is Co-Director of Integrative Health Partners, a Chicago practice group dedicated to integrative treatment.